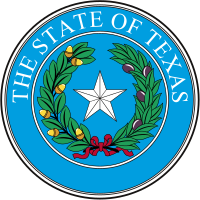 The following is a list of symbols of the U.S. state of Texas. State nickname "The Lone Star State"
A pledge of allegiance to the Texas flag was established in 1933. USS Texas (BB-35), the oldest remaining dreadnought. ^ "State Nicknames South Dakota - Wyoming". www.50states.com. ^ Elliott, Jane (March 22, 2008). "How did bluebonnets become state flower". Houston Chronicle. Retrieved 2008-05-27. ^ "Texas State Symbols - Texas State Library and Archives Commission - TSLAC". www.tsl.texas.gov. "Texas State Symbols". About Texas. Texas State Library and Archives Commission. 2006-11-14. Retrieved 2007-02-01. "Texas House Resolution 84". 42 - The Official State Domino Game of Texas. 2011-06-17. Retrieved 2011-06-17.